A vast number of the pathogens are grouped into communities called biofilms. Biofilms are where bacteria join together on a surface and start to form a protective matrix around their group. One common example of a biofilm is dental plaque, a slimy buildup of bacteria that forms on the surfaces of teeth. Due to their structure biofilms may shelter problematic microorganisms which are difficult to eradicate due to hindered penetration of antimicrobial chemicals. Now, a study led by researchers Rice University develops magnetic bacteriophages, viruses that infect bacteria, in nanoclusters which have the power to punch through biofilms to reach bacteria that can foul water treatment systems. The team state that their nanoclusters deliver bacteriophages to targets that generally resist chemical disinfection. The study is published in the journal Environmental Science: Nano. Previous studies show that biofilms can be beneficial in some wastewater treatment or industrial fermentation reactors owing to their enhanced reaction rates and resistance to exogenous stresses. However, biofilms can be very harmful in water distribution and storage systems since they can shelter pathogenic microorganisms that pose significant public health concerns and may also contribute to corrosion and associated economic losses. Bacteriophages have been investigated as a treatment solution, however, they disperse in solution and largely fail to penetrate biofilms. The current study investigates nanoclusters which immobilize bacteriophages and uses a weak magnetic field to draw them into biofilms to their targets. The current study utilises bacteriophages which are polyvalent, meaning they’re able to attack more than one type of bacteria, to target lab-grown films which contain strains of Escherichia coli associated with infectious diseases and Pseudomonas aeruginosa, which is prone to antibiotic resistance. The bacteriophages are combined with nanoclusters of carbon, sulfur and iron oxide that are further modified with amino groups. Results show that the amino coating prompts the bacteriophages to bond with the clusters head-first, leaving their infectious tails exposed and able to infect bacteria. Data findings show that a relatively weak magnetic field pushes the nanoclusters into the film and disrupts it. Results show the bacteriophage-nanoclusters effectively killed E. coli and P. aeruginosa in over 90% of the film. The group note that bacteria may still develop resistance to bacteriophages, however, the ability to quickly disrupt biofilms would make this more difficult. The lab conclude that their novel approach, which arises from the convergence of nanotechnology and virology, has a great potential to treat difficult-to-eradicate biofilms in an effective manner which does not generate harmful disinfection byproducts. The team surmise their study demonstrates the potential for efficient bacterial suppression using bacteriophages attached to nanoclusters that penetrate biofilms under a relatively small magnetic field. 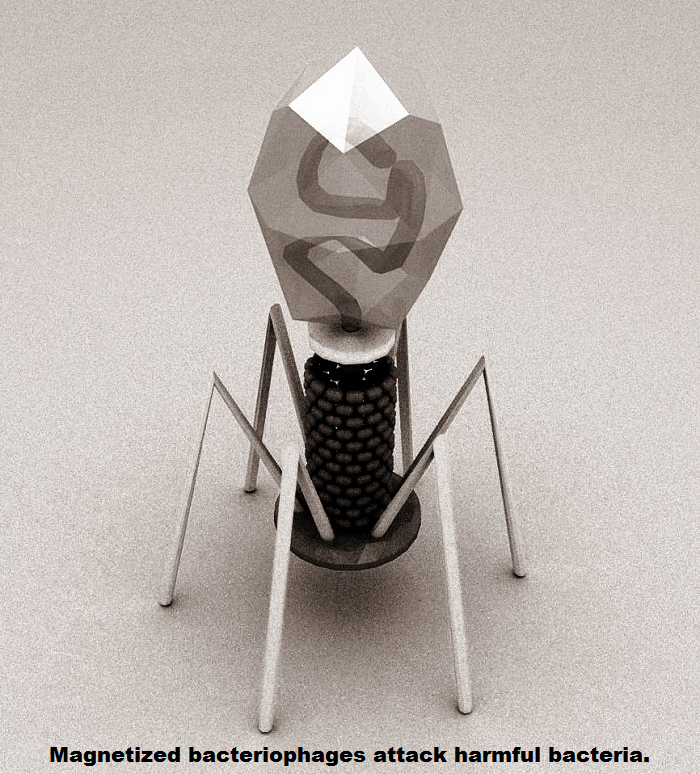 For the future, the researchers state that they are now working on phage cocktails which combine multiple types of bacteriophages and/or antibiotics with the particles to inhibit resistance.